Redwoods are synonymous with the forests of Northern California, but they are commonly planted in home landscapes across a much wider region. They are the world's largest trees, yet they are are a surprisingly good fit as landscape specimens. It's important to clarify exactly which species is referred to when the name redwood is used. 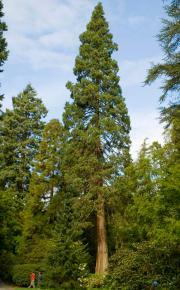 Several species use redwood as part of their common name (Dawn Redwood, for example) but botanically there are two species of redwood: the coast redwood (Sequoia sempervirens) and the giant sequoia (Sequoia sequoiadendron). Giant sequoias grow to a great girth , but they are very difficult to grow outside of their native habitat in the high elevations of the Sierra Nevada mountains and are rarely used in landscaping. Coast redwoods grow in the foggy mountains of the northern California coasts to great heights and are very adaptable landscape plants. Coast redwoods thrive on moisture and fertile soils. They enjoy the cool summers and mild winters of their native habitat, but they can be grown almost anywhere that temperatures stay above zero degrees in winter. They prefer acidic, well-drained soils, just like azaleas and camellias for which they are excellent companions. 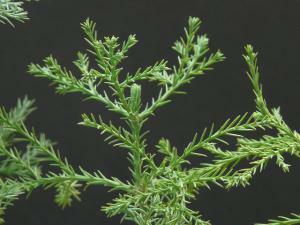 Redwoods start out looking like many of the common coniferous hedge plants, such as arborvitae or Leyland cypress, and they are sometimes used as a tall evergreen hedge. However, they outgrow any other species within a few years, reaching 50 feet tall with an eight-inch trunk by their 20th birthday; the tallest redwoods can grow to over 350 feet tall and 20 feet or more in diameter, though this takes several centuries. Still, it's important to plant redwoods in a place that can accommodate their tremendous size. Despite their eventually massive trunks, redwoods have a very slim profile overall with the canopy of larger specimens rarely exceeding 30 feet in breadth. They have a single trunk, which is straight as an arrow, and short branches than droop gracefully downward. This shape allows them to fit in surprisingly small yards for a tree of their size, without overwhelming the space. The lower limbs naturally die off and can be removed as the trees grow upwards, leaving plenty of open space and sun around the trunk. Planted as individual specimens, redwood trees cast little shade and their extraordinarily beautiful shaggy red bark and fine blue-green foliage make them an attractive year-round focal point. They go well with flowering trees and ornamental shrubs in their understory, such as dogwoods, Japanese maples and abutilon. Carpet the ground with lush deep green foliage plants that compliment the color of the redwood needles, such as oxalis and sword fern. On large properties, a row of redwoods is useful as a screen along the property lines and they are one of the few options where an enormous hedge is needed. But they are also commonly planted in groves, as they grow in nature, where their fallen needles will permanently carpet the ground. In this environment, they will produce deep shade and the acidic soil conditions they create allows little else to grow. 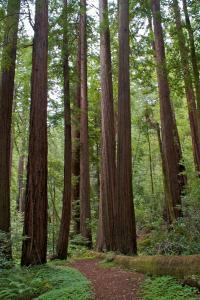 Because of their slim profile, it is possible to plant redwoods trees in rows or clumps as close as 10 feet apart. More than anything, redwoods need water. In nature, they grow right up to the edge of streams and rivers like a willow tree. The more irrigation they receive, the better, as long as drainage is adequate. A deep mulch over the root zone is critical to help young redwoods get established, as it keeps the roots cool and holds moisture. Fertilizing redwoods with composted manure or other forms of nitrogen will only make them grow faster, though it is not necessary unless soil conditions are exceptionally poor. Other than irrigation and mulching, the only maintenance with redwoods is to remove the lower limbs as they begin to die off naturally. 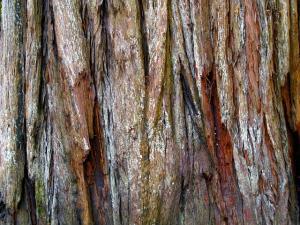 Never top a redwood or prune it in any other way - the form of the tree will be ruined permanently. Redwoods are incredibly immune to pests and disease. Their slim, flexible canopy and extensive lateral root system makes them very resistant to storm damage, so they are one large tree that can be planted close to the house. However, one potential problem associated with redwoods is damage to foundations, driveways, patio and paths from the growing roots. Fortunately this is usually not a problem unless a redwood tree is planted within 10 feet of one of these structures. Though they are evergreen, redwoods still drop a lot of leaf litter, making cleaning gutters, roofs and other surfaces below them a big chore. It's hard to imagine a tree more majestic than a redwood. They are the essence of the forest primeval. Planting one in your yard is a gift to future generations who will enjoy their awe-inspiring presence as the tree grows seemingly endlessly toward the sky.